Stay more connected and productive with a clear, unified view of your email, calendar, contacts, and files. 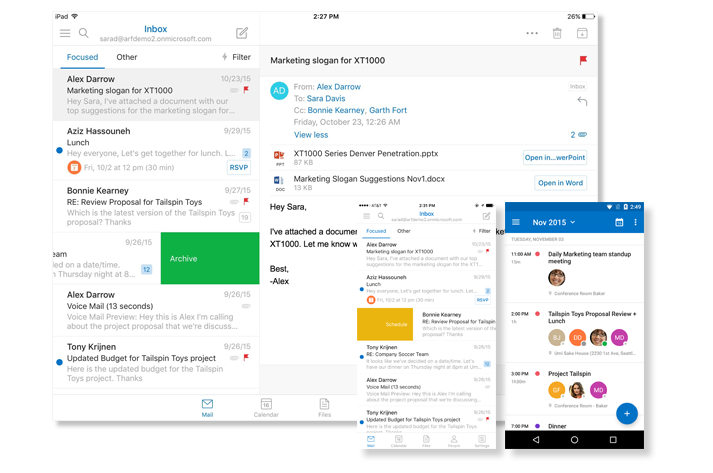 Go beyond the basic email tasks to get more done wherever you are with Outlook on your iPad®, iPhone®, Android™ tablet and Android™ phone. Get more done with robust, powerful features that help you focus on the emails that matter most. Manage your calendar, share available meeting times, schedule meetings, and get reminders. Work with and share Office attachments from your computer or from the cloud.